Ants are usually regarded as the unwanted guests at a picnic. But a recent study of California seed harvester ants (Pogonomyrmex californicus) examining their metabolic rate in relation to colony size may lead to a better appreciation for the social, six-legged insects, whose colonies researchers say provide a theoretical framework for understanding cellular networks. A team of researchers led by James Waters of Arizona State University in Tempe, Ariz. conducted a series of experiments designed to measure the components of ant metabolism, such as oxygen and carbon dioxide, in individual ants and in colonies of ants. The team studied 13 colonies of seed harvester ants taken from a nearby desert and housed in the university’s research lab. By using flow-through respirometry and factors such as growth rates, patterns of movement, behavior and size, the team measured standard metabolic rates (i.e., energy expenditures) of the functioning colonies as well as in individual ants. The researchers found that the metabolic rate of seed harvester ant colonies could not be predicted by adding and dividing the by-products of the metabolisms of all individual colony members. In fact, the colony as a whole produced only 75% of the by-products that its individual members would produce individually if each ant lived alone. Thus, the colonies’ metabolism was less than the sum of all the individual ants’ metabolisms. That the distribution of individual walking speeds became less uniform as colony size increased suggests that disparities in effort among individuals increased with colony size. The 0.75 scaling exponent for colony metabolic rate strikes Mr. Waters as important because it indicates that colony metabolism is influenced in a way similar to what most individual organisms experience. 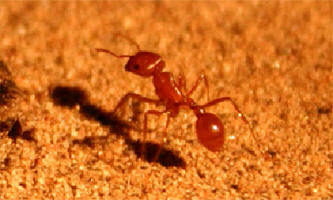 Yet a colony of ants experienced this decline as though it was one single “super-organism”. Mr. Waters noted that the team isn’t sure why this is so, but he has a few ideas. He added that a larger size might afford a colony a division of labor not possible in a smaller colony. Individuals in a smaller colony would have to work harder to satisfy basic energy demands. According to Mr. Waters, because ant colonies behave metabolically like individual organisms, studying how a colony’s size changes its metabolism could offer useful insight for developing theories about medication dosage in humans. This is not to say that ant colonies function like individual humans. Rather, ant colonies could serve as a model for testing theories about the role of networks among cells in human metabolism.